South Vietnamese Army II Corps 76th Ranger Battalion Tab. Vietnamese machine embroidered. Unused. South Vietnamese Army Ranger 2nd Corps Intelligence Pocket Patch. Vietnamese machine embroidered. Unused. South Vietnamese Army Ranger 2nd Corps Recon Patch. Vietnamese machine embroidered . Unused. South Vietnamese Army Ranger 2nd Corps Recon Pocket Patch. Vietnamese machine embroidered. Unused. South Vietnamese Army Ranger 2nd Corps Recon Tab. Vietnamese machine embroidered. Unused. South Vietnamese Army 3rd Corps 3rd Ranger Group, 36th Ranger battalion Patch. Vietnaese silk woven. Unused. 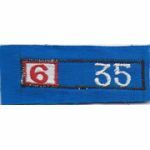 South Vietnamese Army 6th Ranger Group 35th Battalion Tab. Vietnamese machine embroidered. Unused. 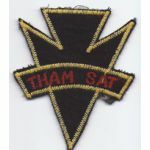 South Vietnamese Army 7th Ranger Group 85th Battalion Tab. Vietnamese machine embroidered. Unused. South Vietnamese Ranger Bien-Phong Tab. Vietnamese hand embroidered. Unused. Early South Vietnamese Army Ranger Section Patch. Vietnamese hand embroidered. Unused. 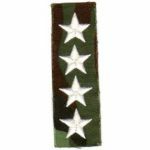 South Vietnamese Army Ranger Bullion Beret Badge. Vietnamese gold and silver bullion embroidered details on a velvet liek background. Unused. 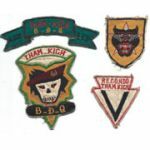 ARVN Biet Dong Quan / Ranger Patch. Vietnamese silk woven. Unused. ARVN / South Vietnamese Army Ranger Border Defense Tab. Vietnamese hand embroidered. Unused.